I was still curious after taking this photo of the trees on 24th Street at Bryant earlier today. How could I identify these trees? I did several searches on variations of “trees on 24th street mission san francisco” which brought up some great local links, including SFTrees and a good list of trees in the Mission district but without photos, making it hard to decipher. I did some Google image searches on species listed but that only ruled out most of them. I did see a mention of a Chinese Banyan which looked like it could be but the many of the photos returned in Google showed bansai versions. After some more search, I ended up at the site of the San Francisco nonprofit group, Friends of the Urban Forest and saw a link to a collaborative project called the Urban Forest Map. 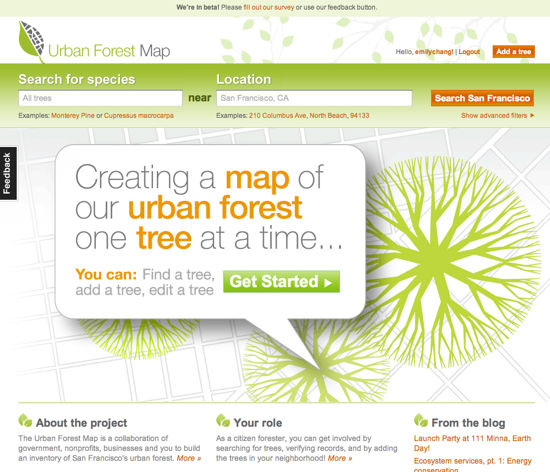 The Urban Forest Map is a collaboration of government, nonprofits, businesses and you to map every tree in San Francisco. Along the way we’ll calculate the environmental benefits the trees are providing — how many gallons of stormwater they are helping to filter, how many pounds of air pollutants they are capturing, how many kilowatt-hours of energy they are conserving, and how many tons of carbon dioxide they are removing from the atmosphere. The information we gather will help urban foresters and city planners to better manage trees in specific areas, track and combat tree pests and diseases, and plan future tree plantings. Climatologists can use it to better understand the effects of urban forests on climates, and students and citizen scientists can use it to learn about the role trees play in the urban ecosystem. What a fantastic idea. 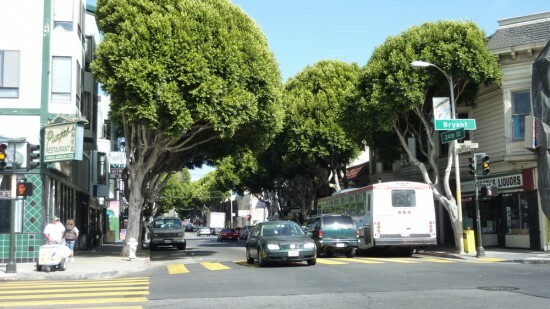 I did a location search on the site for 24th Street at Bryant, zoomed in on the map, checked the map points for trees on that block and sure enough, located the Chinese Banyan trees that line both sides of the street. I signed up and added my photo to the page. Each tree page includes user contributed content such as scientific name, trunk diameter, height, as well as site-provided data like estimates of yearly energy conserved, air pollutants removed, carbon dioxide reduction, and more. There are also two Google maps, one showing a satellite view of the location and another of the street view. The project is also open source and if you’re a developer or want to make a mashup, you can download the map data (links to “export options” above the map). I’m enamored with the idea and purpose of this site. I’ve been fascinated by the trees in the city and the West coast in general since moving here from the East coast. Excited to be able to learn more about the more than 200 species of trees in the city alone. As equally excited about contributing photos to tree pages. Going to start with my hood in SoMA and places I frequent. Hopefully, this idea will spread to other cities, with the cooperation and passion of local citizens, the government, scientists and environmentalists to make our urban ecosystems flourish.